With The Witcher 3: Blood and Wine you will get new mutations and specializations, so the game again gets some fresh air just for a promoted player. At the beginning of the side quest “Turn and Face the Strange,” in The Witcher 3: Blood and Wine, you will encounter a missing professor who has studied Witcher mutations. You have to complete his quest in order to unlock new mutations and additional specializations in a new mutation system. 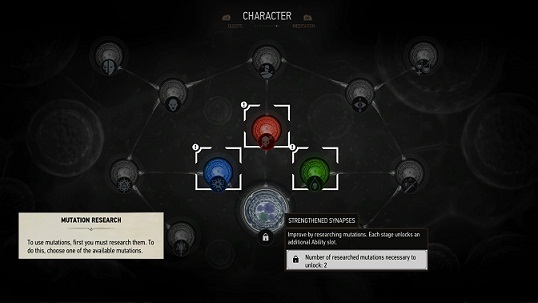 In our guide, we show you how the new mutation system works and what new mutations are there. These specializations need to be researched in the alchemy laboratory, for that you need your talent points and mutagens. The Strengthened Synapses level up automatically by investing talent points, making it additional ability (Skill Slots) that have a particular color. This must match the talent. However, some advanced mutations can also be assigned to multiple categories. You can only have activated a mutation simultaneously, can change between these but at any time.